So glad I got a flash doll finished yesterday! 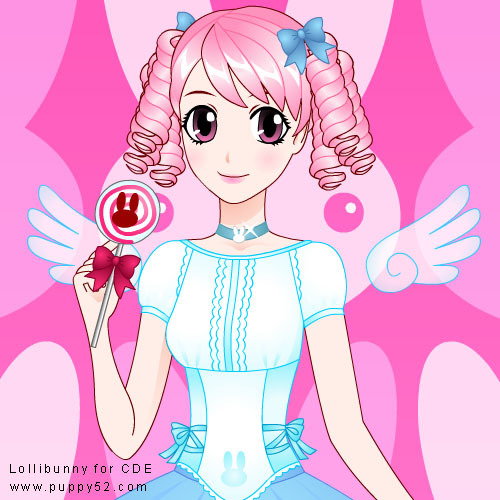 I present to you Lollibunny ! I hope you like her! Yesterday was my “working at friend’s shop” day, so I did some sketching while I was there. Hope to scan and upload soon! Flash doll Andrica, now on cartoondollemporium.com! Wow, it’s such uncanny how similar she looks like my old version of Kako (Mirai’s sister) almost 13 months ago. Eerie! P.S. Can’t quite access the Flash game, argh. It shouldn’t be that eerie since most if not all things had been done before ^^; I think she is a little bit too mature looking to be Kako tho, so Since Kako has been renamed to Haruka, is Kako gonna be related to Akiko? i can’t access the flash at first too. did a refresh and it works. i tried it at home. it works fine. seems like the longer i play the more points i get right? gordon oooh did U actually registered (and get the CDE dollars?) so what happens is to use the cde dollars, U need to sign up for a profile, U can buy clothing and hair etc etc for your avatar as well as other things available on the site ^^ But please know it is not compulsory for U to do that lol!